to happen in Melbourne. 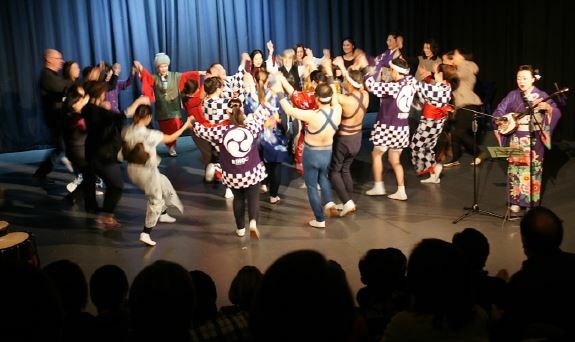 Although we have a variety of Japanese instrument performers here, it is not very often that we get to collaborate with this many traditional Japanese dancers. 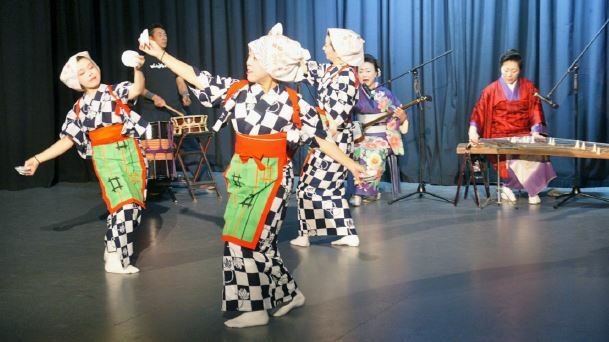 Each was a master of their respective art, be it dance, koto, shamisen, or storytelling. This concert also featured a piece between the 21 string koto (played by Izumi) and shakuhachi(Anne), which is quite rare as the 21 string koto is not as common as the standard koto. The venue, the Alan Lawrence Theatre in Mckinnon Secondary, was a good venue with top notch technology. On the day of the concert, the theatre was packed with various audience members. Each was brimming with excitement and curiosity. And at the end of the concert, I could tell that everyone was glad that they came to listen. Many of the audience who approached me at the end had never seen such a collaboration, and expressed interest in attending another performance such as this. Personally, this was a pleasant experience for me. 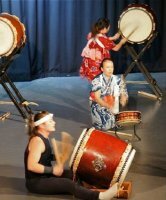 To be able to work with professional performers from Japan again reminded me of the days when I lived in Japan. All the performers were very warm and friendly people, but at the same time took their art very seriously. I am looking forward to having them back here in Melbourne one day.